Miracle Method can add a bullnose or other custom edge design to laminate countertops, like Formica® or cultured marble vanities. 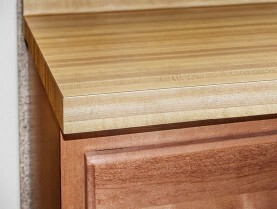 Straight edge countertops can quickly date the age and appearance of your kitchen or bath. 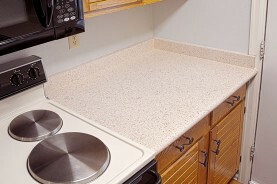 Miracle Method has a unique process that can transform the appearance of your countertops and vanities into a solid-surface look. A rounded bull-nose profile softens the look of your counters and can improve the look and feel of your kitchen and bathroom. 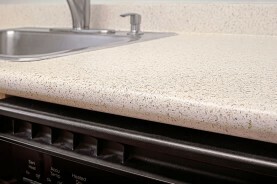 Softer edges and a colorful stone finish can dramatically upgrade your kitchen or bathroom. 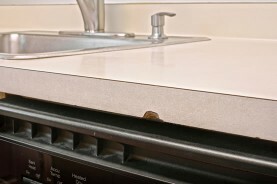 Update the look and shape of your countertop! 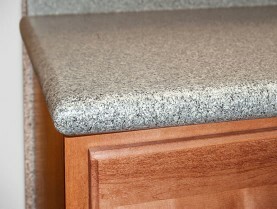 The bullnose fixed the chip on this countertop! An updated look for this 80's kitchen! Bullnose and Other Countertop Edges – How do I find a Miracle Method Office? 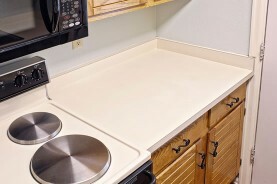 If you would like to see samples of custom edges for your countertop, click Find a Location or call our toll free locator number, 1-888-271-7690, to reach the nearest Miracle Method professional.